Hello and THANK YOU to all the folks who came to my concert at the Anchor Coffee House at Westminster Presbyterian in Des Moines on Saturday night! I had a fantastic time and sang to a full house. YAY! Thank you to Matt Culp for all your help getting me there and Dave – the sound man! I was especially happy to see my former gymnastics coach at Grand View University, Karen Bason! She is the sweetest person around! This is a picture of our team from those days. I am third from the right. I loved being on the team and floor ex was my favorite event. So many of you have asked what happened at IMMERSE 2015 so I thought I would make it official and put it in writing. IMMERSE is music conference in Nashville put on by GMA (the Gospel Music Association) for artists, songwriters, vocalists, and worship leaders. It includes classes from the creative to the business side of things, performances by various artists, is a great way to network, and a show ‘em what you got competition called reVIEWyou. So, I signed up to attend and entered the competition. My first time to Nashville – WooHoo! There were 3 categories to enter: songwriter, artist/writer, and vocalist. I entered a song in the artist/writer and vocalist categories. Turns out I cut the mustard and made it into the live competition. So, on Sunday, June 14, Paul and I jumped in the car and drove down to Music City. There were about 400 other people who also cut the mustard. Everyday, from 1pm – 6pm, the competitions in the 3 categories went on. Each performance was critiqued and my song went through some minor revisions. Fortunately, I kept getting promoted, so-to-speak, to the next level and stayed in the competition until it was whittled down to the top 3 in each category. Unfortunately, this meant I missed out on most of the classes and speakers (but I will receive the recordings). The final performance was on Wednesday night, June 17th before twenty professionals in the music industry. Believe me, I never thought I would make it through to this level as the competition was fierce. The final winner in my category (artist/writer) was the lovely Roslyn Welch who played a cajon. She was the very first person I met and we became immediate friends. All-in-all it was a great experience for me and I am truly thankful for it. Feel enormously blessed and more at peace. I don’t know if or when I will ever lose the desire to sing, but for now that desire it is still with me and I keep listening to what God might have to say next. I’m all ears. My heartfelt and deep thank you to everyone was pulling for me! Your FB messages were tremendous! Oh ya, one more thing, the title of my song is “A Cross on a Hill”. 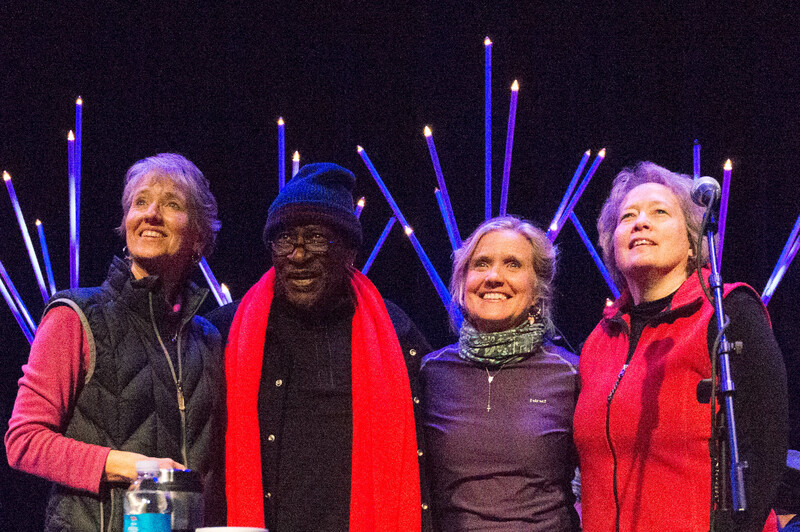 Many thanks are overdue to all of you who helped make 2014 such a wonderful year. Mere words don’t seem to be enough as we musicians are so depend on your kind and continued support for what we do. Thank you so much coming to a show, bringing a friend or two, buying a CD, forwarded a newsletter to help spread the word, or saying an encouraging word. As I think about the past year, several highlights come to mind. 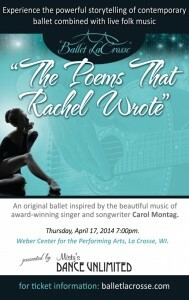 First, the performance of my original songs at the Weber Center for the Performing Arts in LaCrosse, WI with Ballet LaCrosse. 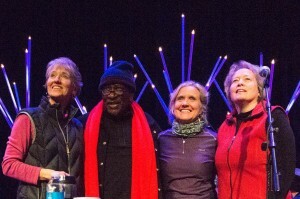 To the incredibly generous, kind, and talented Artistic Director, Kennet Oberly – I thank you! What a thrill to watch people dance to your music! Second has to be the beautiful Klopfenstein Amphitheater at Lowe Park Arts and Environment Center in Marion, IA. That beautiful night and lovely audience will be etched in my mind forever! Thank you Angie Pierce Jennings and the Marion Arts Council. Last, but not least, has to be the Tribute Christmas Concert at the fabulous Paramount Theatre. Our special, surprise guest was none other than the Harry Elston from Friends of Distinction! Nina, Kathy and I were able to be his background singers for his hit song, Grazin’ in the Grass. What a gas, baby, can you dig it? Oh, yeah! THANK YOU one and all, from the bottom of my heart, for making 2014 the best year ever! Can’t wait to see what 2015 brings! I wrote this song for my friend, Carla. It seems appropriate to publish it now in light of all the news we are hearing about the care (or lack thereof) of our veterans by the VA. Carla’s father served in Vietnam and her husband served in Iraq. I admire her courage, strength and optimism in the face of all the difficulties that she deals with every day as she cares for her husband. I honestly have to shake myself sometimes. I am so grateful, humbled, and honored to be asked to do another ballet. Somehow I know God has my heart. When I was in high school I wanted to be a dancer. The Repertory Dance Theatre of Salt Lake City, Utah (founded at the University of Utah) was performing at Iowa State University at that time and came to Ames High School for an assembly. I was completely blown away by that performance. And KNEW – that’s what I want to do!! I had always loved dancing around the house, but had never had a single lesson. I got all the brochures for the University of Utah and was about to apply, but then… chickened out at the last minute…it was so far from home, you see. I have always wished someone had said, “You can do! Go for it!” Maybe it just wasn’t the plan for me. Instead, I earned a degree in graphic design and was involved in women’s gymnastics. Bottom line – I do feel incredibly blessed to have this opportunity to participate in something so beautiful. That kind of beauty just sweeps me away! Thank you, God! Just received this poster from Ballet La Crosse. It’s such a pleasure to work with Kennet Oberly, the Artistic Director. If you love music and love ballet (like I do) this is a must see performance. 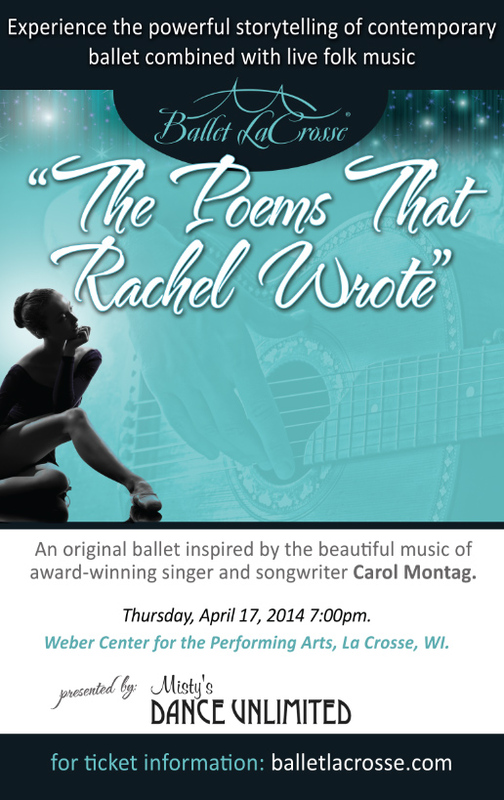 Hope my Midwest folks can make to the Weber Center for the Performing Arts on Thursday, April 17th in La Crosse, WI! This is interesting. One of my tasks for the music for the ballet “The Poems Rachel Wrote” (for Ballet La Crosse) is to re-write the lyrics to my song, “Like a Dandelion”. The goal is to modify the words in order to fit the storyline created by artistic director, Kennet Oberly. It’s a strange feeling, but a good exercise for me. In Port Saint Lucie, Florida with my friend Lori Karas. Enjoying the sun, the shrimp, and the beach! I’m really looking forward to seeing my friends Julie Gammack and Richard Gilbert in Gulfport on Sunday, February 23rd for a house concert. Years ago, Julie wrote several extremely nice articles about me in The Des Moines Register and I am forever in her debt for being so kind and generous. I’m trying to refresh my memory so I can sing this song written for Richard and based on a poem he wrote titled My Time Now.